Dolphy Aid Para Sa Pinoy Foundation, Inc. with PLDT and Bench present Dolphy Alay Tawa, a musical tribute to the King of Comedy slated on September 19, 2012 at 7pm at the SM Mall of Asia Arena. 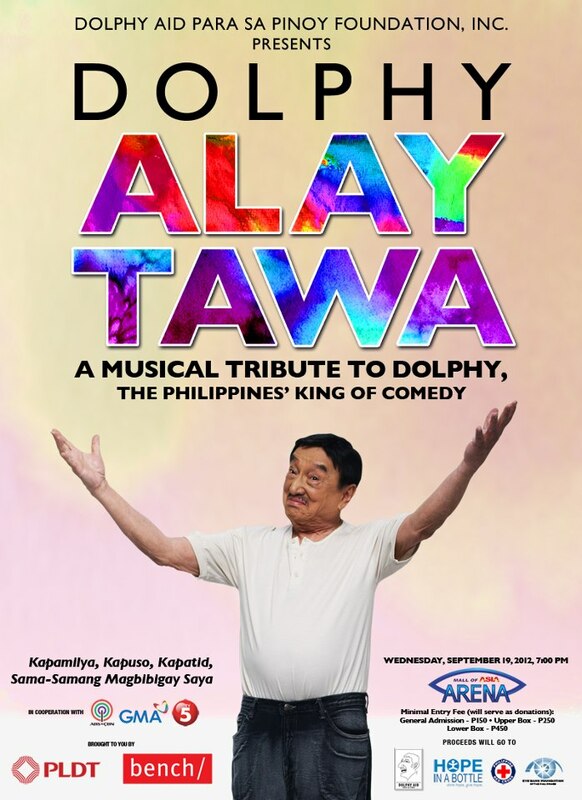 Local A-list celebrities are gathering in this special concert to commemorate the colorful life of the Comedy King, Dolphy. With its themes and narratives taken from the book "Hindi Ko Ito Narating Mag-Isa", authored by Bibeth Orteza who is also the show's scriptwriter, the concert promises to entertain the audience and remember Dolphy as the entertainer, uphold the mission of The Dolphy Aid Para Sa Pinoy Foundation, Inc, which in cooperation with SM Mall of Asia Arena, Bench, and PLDT is organizing the event with the noble purpose of sharing part of the concert proceeds to various noteworthy causes. "We wanted to honor our father and celebrate his life so it was only natural to give back freely. Secondly, we wanted to thank all those who prayed for him and joined us in our grief by emulating his big-heartedness by sharing the donations we will receive from this tribute with philanthropic efforts”, shared the Quizon clan's acknowledged spokesperson actor-director Eric Quizon. Proceeds from the tribute will go to the Philippine Red Cross, specifically for disaster preparedness and its blood bank, Friends of Hope, Inc., to sponsor the building of a classroom at E. Jacinto School in Velasquez, Tondo, and Eye Bank Foundation of the Philippines, particularly on its education on eye care and corneal transplants. A bona fide member of the League of Red Cross and Red Crescent Societies since 1947, PRC responsibly takes care of six major services, namely, Blood Services, Disaster Management, Safety Services, Community Health and Nursing, Social Services and Volunteer Service. All of these are part of the valuable principles of the International Red Cross and Red Crescent Movement which include humanity, impartiality, neutrality, independence, voluntary service, unity and universality. Interestingly, actress Rosa Rosal has sat on the Board of Governors since 1965 and has carved herself as PRC's celebrity face and whose activities made her an awardee of the Ramon Magsaysay Award for Public Service. The Emilio Jacinto Elementary School is named after the hero pertained to as "The Brains of the Katipunan" during the Philippine Revolution against Spain in 1896. Established in 1995, the Eye Bank Foundation is a non-profit,non-government, humanitarian organization operating a medical eye bank called the Santa Lucia International Eye Bank of Manila (SLIEB), a state-of-the-art eye banking facility that collects, processes, evaluates, stores and distributes quality corneal/ eye tissues for transplant, research and education. It has provided the gift of sight to corneally blind individuals through corneal transplants. A minimum donation of P150 is equivalent to one ticket at the General Admission, P250 for Upper Box and P450 for Lower Box. Tickets are available at SM Tickets; for more information, call 470222.